This is a very slim volume, it holds just nine short stories, and it is a little gem. 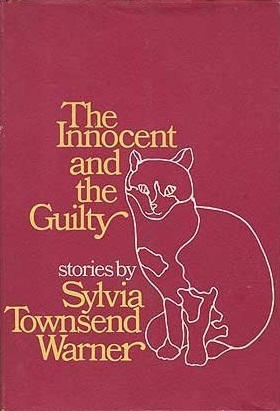 Because Sylvia Warner was so very good at short stories; a mistress of the art. She brought such imagination to stories set in a very real world; she crafted, she distilled, to produce perfect miniatures. These stories – seven written for the New Yorker and two specially written for this book – are diverse, but they all spin around the theme of innocence and guilt. Not in such black and white terms of course; Sylvia Townsend Warner was much more subtle and much more clever than that. She wrote with such lovely irony and understatement. That worked so well for ‘Bruno’, the story of an elderly Scotsman with a very handsome younger companion. He thought that when they went home to his family estate his companion would play nicely, but that wasn’t in his nature. ‘The Perfect Setting’ is a lovely social satire. The widow of a poet is sure that she has uncovered important documents that will enhance his reputation, but the three interested parties who visit her all have very different ideas. There’s a short story that plays out like a scene from ‘Play for Today.’ ‘The Quality of Mercy’ has two roughly-hewn young men help home a young woman who had had far too much to drink. They are kind, she is grateful, but her family blame them for the state she is in and hurl abuse. It’s simple and its perfectly executed. The voice encouraged him to go ahead. After a pause, it offered him the alternatives of the Fire Brigade, the Police, the Ambulance Service. None of those seemed perfectly to apply. But it wouldn’t so to sound unappreciative. It’s a fragment – several of these stories are – but fragments that must have been broken away from a whole that was exquisite. One story though is exceptional, and I think it is one of the finest short stories I have ever read. ‘But at the Stroke of Midnight’ moves from formality to wildness; from domesticity to freedom; from safety to danger. It’s beautifully observed and understood by its author. Some authors would have turns the material into a whole novel – and it could be ‘Lolly Willowes’, reimagained when the author was thinking about the world rather differently – but here it is the perfect miniature. I can’t explain it – I shouldn’t try to explain it – what I should do is tell you to read it. Don’t look it up; go in cold and be dazzled as I was. This volume is out of print I’m afraid, but Open Library has it, and I’m told that it’s in the volume of collected short stories that Virago has in print. I struggle to write about short stories, but I do know that Sylvia Townsend wrote them very, very well. Thanks. I’m into short stories and novellas at the moment so I may check it out. I think when short stories are done well they surpass novels. In an ideal world I think I’d move between short stories and long, long novels. STW wrote more than 100 short stories for the New Yorker over the best part of forty years, so there are plenty of hers out there to try! What a lovely sounding collection. Earlier this evening I finished Summer will Show and will try to get a review written by Friday. It’s a biggish novel, quite complex but very very good with so much packed into it. I’m definitely inclined to try one of her novels next. I have ‘Summer Will Show’ but as I might try to work through them chronologically, in which case ‘Mr Fortune’s Maggot’ will be up next. I’ve yet to try anything by this author, but her short stories could be a great introduction. They sound lovely! What a delicious review Fleur. I did read something by STW some years ago, and found it captivating, it may have been Mr Lolly’s Maggot – but you have just sent me to my bookcases, because I was also certain I did have something by her a-lurking, and indeed I found short stories entitled Kingdoms of Elfin, which I signed, dated (1981) and by all accounts bought in Loughborough!! I went through a period of time where I used to sign my books, probably because I was lending them out more than I do now, as I got fed up of not getting them back. Not to mention recording where I bought them, so years later I could look back and wonder why on earth I was in Loughborough etc. Looks like there will be memory lane to be travelled. I have yet to read my own copy of ‘Kingdoms of Elfin’ but it looks lovely, I’m told its lovely, and I love that it seems like an author doing just what she wanted to do. I was fortunate enough to find a a lovely selection of her books in my local second hand bookshop a few years ago, and of course I pounced on them. What do you use for digital reading? If it can cope with DRM you’ll find this on Open Library, ready and waiting to be borrowed for a fortnight. There are novels and other volumes of short stories to be had in print too, and I wish you happy hunting. I use Kindle – is that a compatible format? I know that my local library allows borrowing of digi, but NOT for Kindle, anything else only. And the eink format which Kindle has is the only acceptable read for me, having eyewigged what others seem to read on (if they aren’t ereading on Kindle) the glare puts me off. I’m afraid it isn’t; Kindles don’t seem to like to talk to anyone but Amazon. I use a Nook tablet to read Open Library PDFs with DRM – that’s quite comfortable indoors, but I much prefer my Paperwhite for reading anything else that isn’t a paper book. Yes, that is the trouble with Kindle. Or rather, with Amazon!! You must – she’s very good at short stories, her literary executors did the selecting, and it would be an excellent investment. You say you struggle to review short stories, but this one is masterful! I love STW’s short stories (all except the elfin ones, I’m afraid) and my absolute favourite is the one about the teddy bears … I can’t remember it’s title, can anyone out there help me? And other wonderful reads are STW’s diaries and her letters to and from William Maxwell, editor of the New Yorker and one of my all-time favourite novelists. You’re very kind Jane, but I’m sure you’ll understand the skill with which Sylvia Townsend Warner strung together words could make anyone writing about her feel a little inadequate. I have yet to find the teddy bears, but I have more stories, and letters and diaries, in my sights. I’ve been coming across Sylvia Townsend Warner’s name quite a lot lately and was wondering where to start with her work. This book sounds like an excellent place. Great review! It would be – and so would any of the short stories. The other short stories that I’ve read have been very good too – the new Yorker published more than a hundred of them over many years – so I’d say you’d be safe picking up any that you find. Sylvia Warner is on my Classics Club list, although not this particular book. Sounds delightful! It is – and she’s such a good writer that I’m sure you’ll enjoy the book you’ve chosen for your list. The only one of those I’ve read is Bit At the Stroke of Midnight, which is in my Virago book of STW short stories, and I think your comments on it were spot on. Isn’t it good?! It was definitely the pick of this collection.